Enbridge is working on an aggressive and complex plan to make shareholders rich. Is it worth the risk? Enbridge Inc. (NYSE:ENB) has an incredible portfolio of energy assets. It has an incredible history of rewarding investors with dividend hikes. And it has a big plan to keep expanding its assets while continuing to reward investors. It could be a key piece of an income portfolio that turns you into a millionaire. But that big plan needs some extra attention right now. Here's what you need to know before you buy Enbridge stock with the dream of it turning into a millionaire maker. Based out of Canada, Enbridge is one of the largest energy companies in North America. Its assets are focused in the midstream energy space (it has interests in clean energy facilities, but they are relatively small). Its pipelines and other assets help move oil and natural gas across Canada and the United States and even into Mexico. Only a handful of midstream companies have the scale and reach of Enbridge, including industry bellwether Enterprise Products Partners L.P. (NYSE:EPD), Kinder Morgan, Inc. (NYSE:KMI), and TransCanada Corporation (NYSE:TRP). All in all, Enbridge is a standout in the midstream space and one that could be a key piece of a portfolio that lifts you to millionaire status. But you can't blindly jump aboard without a closer look at the company's plans for the future. A few years ago Enbridge bought Spectra Energy, a U.S. midstream company that greatly expanded the Canadian company's reach and opened up new growth opportunities. However, after consummating that deal Enbridge turned into something of an octopus, with parent company Enbridge as the body and four controlled companies underneath: Spectra Energy Partners, Enbridge Energy Partners, Enbridge Energy Management, and Enbridge Income Fund Holdings. At one point these controlled entities made sense as funding vehicles, but a shifting market environment reduced the value they offered to the parent. So Enbridge decided to simplify its corporate structure, inking deals to buy out the outstanding shares of the four companies. This was a good call. It will make Enbridge easier for investors to understand and will allow the company to benefit fully from the cash flows these entities generate, since outside investors will no longer own pieces of them. While Enbridge is doing this, it will also invest heavily in its portfolio. Between 2018 and 2020, the midstream giant is planning to spend a huge $22 billion Canadian on growth projects. In 2018 alone it expects these investments to help push EBITDA higher by 21% and distributable cash flow up by 17%. All of this spending will also support continued dividend growth, which is projected to be in the 10% range over the next three years. Beyond 2020 management believes there will be opportunities to invest an additional CA$30 billion, or more, across the company's portfolio of assets. And while it's doing that, the company is going to be focusing on its balance sheet. Debt rose dramatically following the Spectra Energy acquisition, leaving the company heavily leveraged relative to peers. 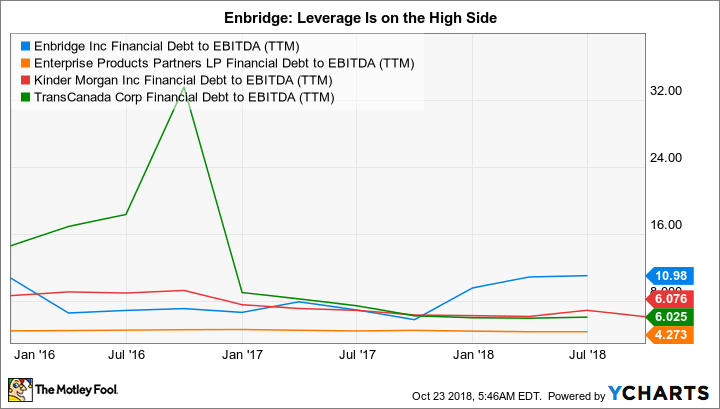 Debt to EBITDA, for example, is currently over 10 times -- Kinder Morgan and TransCanada are at six times, which is still relatively high compared to more conservative midstream players which tend to be in the four-times range (like Enterprise Products Partners). This is a necessary move to assuage worried investors and to show that the dividend is on solid footing. Leverage is one of the reasons the stock yields a generous 6.3% today and more conservative peers have yields in the mid-5% range. If you think all of that sounds like a lot, you are correct. But Enbridge is also looking to sell assets to help fund all this activity. It is working on or has already completed around CA$7.5 billion in asset sales. The sales will help refocus the portfolio on regulated pipelines and utilities, a conscious decision that should make Enbridge's cash flows more predictable. So there's a double benefit here, since it isn't selling core businesses. But big transactions take time and effort to get done, so this is just one more complication to add to the mix. In the end, there are a lot of moving parts at Enbridge today. If history is any guide, management will be able to successfully navigate the path it has laid out. But you shouldn't just buy Enbridge and expect everything to work out well. All the moves it has planned are interconnected, and a misstep in just one piece of this complex puzzle could have tap-on effects in others that lead Enbridge to fall short of its goals. 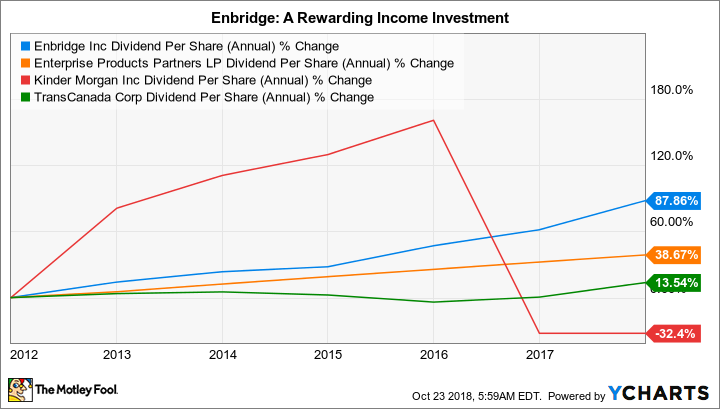 If everything works out as planned, Enbridge looks to become a millionaire-maker stock, but you'll need to watch closely over the next few years to make sure management keeps hitting the aggressive targets it has set out.